We asked our Judson teachers the question "Why do you love teaching at Judson?" and we wanted to share some of their answers. We asked our Judson teachers the question "Why do you love teaching at Judson?" and we wanted to share some of their wonderful answers. Mrs. Campadonico, Kindergarten teacher, is in her eighth year at Judson. She is trilingual (English/Spanish/Indonesian) and has her BA in Early Childhood education. She and her family served in Indonesia for many years before coming to Judson. She said of her experience at Judson, "My very first class are now 9th graders! It is such a great honor to see students grow and develop into such wonderful young people." Miss Castren, 3rd/4th grade teacher, is in her first year at Judson. She has her BA in K-8 Education from Azusa Pacific University and has experience teaching in a nearby school district. She loves teaching at Judson "because of the incredibly supportive staff and families." Miss Todd, our Junior High and High School Math teacher, has her BS in Mathematics from Biola University. One interesting fact about Miss Todd is that she grew up in Hawaiil. In her 3rd year at Judson, Miss Todd says, "With the mixture of all the different cultural backgrounds represented by the student body and the staff at Judson, there is new culture created here of understanding and learning from each other. It constantly challenges me to get away from the assumptions biases that are ingrained in me and to think about others in different ways. I can see this environment has taught me to look at others not with judgment but with curiosity and a desire to understand them and connect with them which has really helped me to more fully understand God's grace." Mrs. Giron is in her fourth year of teaching Junior High and High School English at Judson. In addition to a B.A. in English with a writing emphasis from Azusa Pacific University, she also studied for one term at Oxford University in England . Prior to teaching at Judson, Mrs. Giron worked in the Pasadena City College English Department as a writing consultant. Mrs. Giron, a published author, received the 2013 American Christian Fiction Writers Genesis Award and is a finalist again this year for the same award for her new book. 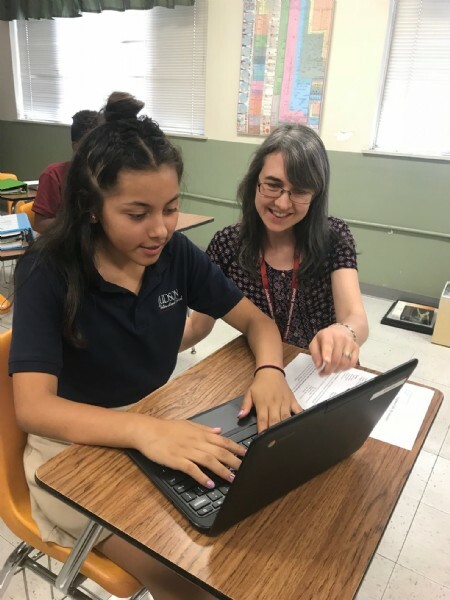 Mrs. Giron says of her experience at Judson, "I love the chance Judson gives, through our diverse student body and faculty and globally-focused curriculum, for young people to develop a worldview aware of God's heart for all peoples and cultures and His image reflected in them. " Mr. Marroquin is in his first year of teaching Junior High Bible. He holds an MDiv from Fuller Seminary and is the Family Ministries Director at New Life Christian Church. Judson has actually been part of his life for many years since his wife Lynette, registrar at Judson, has been at our school for five years and his sister Bethany also used to work at Judson. One interesting fact about Lynette is that she has lived in eleven different countries, one month at a time, during an 11 month-long missions trip called The World Race: Zimbabwe, South Africa, Swaziland, China, The Philippines, India, Romania, Ukraine, Honduras, Nicaragua, and Costa Rica. Mr. Marroquin says he loves teaching at Judson because "Judson students are eager to learn, deep thinkers, and just plain fun. Getting to walk through the greatest story of all time with them in the Bible has been an unbelievable experience already, and the students and I like to challenge each other to think about things in a new way." Mrs. Graves, English Language Development teacher and Director of International Student Services, is in her fifth year at Judson . She has her BA from the University of San Diego and has done post-graduate studies at UCLA. She has lived in England, Switzerland and France. An interesting fact about Mrs. Graves is that she has two sets of twins with one single in the middle. Her children grew up acting in film and television, including Cheers, ER, Life Goes On, X-Files, Pirates of the Caribbean, Valentines Day, The Terminal. Mrs. Graves loves teaching at Judson "because of the strong sense of community and the opportunity to learn about other cultures on a daily basis." Mrs. Aasland, High school World History teacher and Director of Admissions and Marketing, is in her 7th year at Judson. She holds a BA in Sociology/Anthropology from Carleton College and an MA in Public Administration from Humphrey Institute at the University of Minnesota. Prior to working at Judson, she and her family of six lived and served in Kazakhstan for 16 years. Mrs. Aasland also had an international childhood, living in a variety of countries including Turkey, Italy and Nigeria. An interesting fact about Mrs. Aasland is that she became a Christian at an international school in Nigeria. 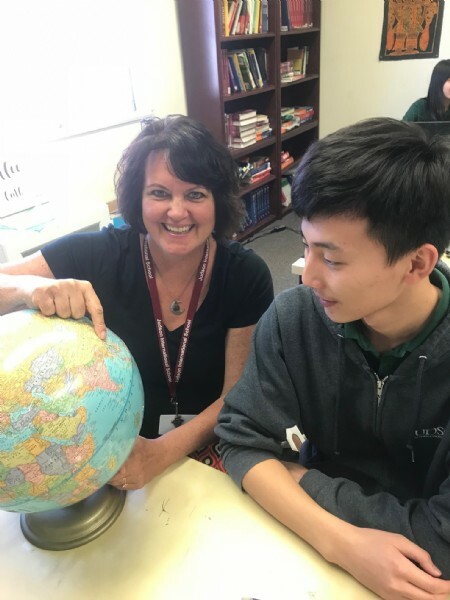 Mrs. Aasland loves teaching at Judson because "our approach of being both Christian and international is so unique and special. I get to teach and work with people from around the world who have a big vision of God and His love for the nations." Mr. Dixon, PE teacher and Athletic Director, is in his first year at Judson. He comes to us with a a BS in Kinesiology and an M. in Kinesiology. 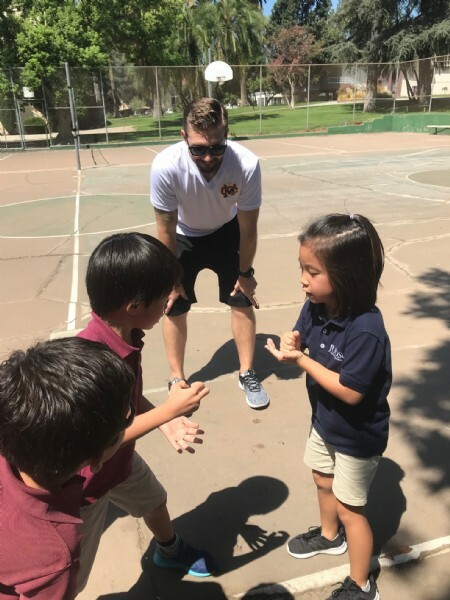 Prior to working at Judson he taught at Cal State LA where he helped start a number of program, including programs to teach students to become personal trainers and helping student-athletes perform academically. Mr. Dixon says "I love the people at Judson. The faculty is welcoming, friendly, and helpful, and the students are a joy to work with. I really enjoy the ability to get to know the students more, afforded us by our small class sizes. I couldn't be happier!" Miss Plog, Musical Theater Director, is in her 2nd year at Judson. She graduated from Azusa Pacific University with a B.A. in Theater Arts. Miss Plog has directed and choreographed numerous shows, including productions with Showlights Theater, Pasadena City College and Judson International School. One interesting thing about Miss Plog is that she performed an original work with a troupe of theater students at the International Edinburgh Fringe Festival in Scotland. 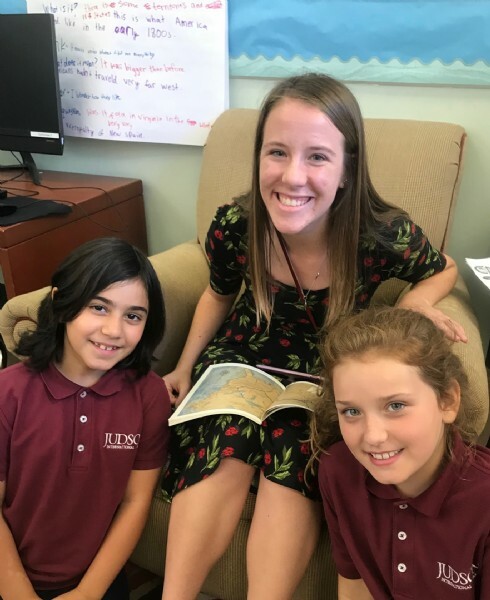 Miss Plog says of teaching at Judson " The biggest highlights for me of teaching at Judson have been the community and the emphasis on Christ-centered education. It is such a gift to work in an atmosphere that is filled with light and love of God. It's a joy to work at a school where I am given the opportunity to integrate spirituality and Biblical values into the performing arts." Mrs. Bjoraker, principal of Judson School, is in her twenty-second year at Judson. Born in New Zealand, Mrs. Bjoraker served in Israel with her husband and 3 children for eight years. One interesting fact about Mrs. Bjoraker is that in addition to having an MEd in Educational Leadership, she also is an RN! Mrs. Bjoraker loves working for Judson because "we have an educational and Biblical worldview that is second to none!" Mr. Hogue is in his first year at Judson. He has a BS in Physics from Azusa Pacific University and an MS in Physics from UC Riverside. 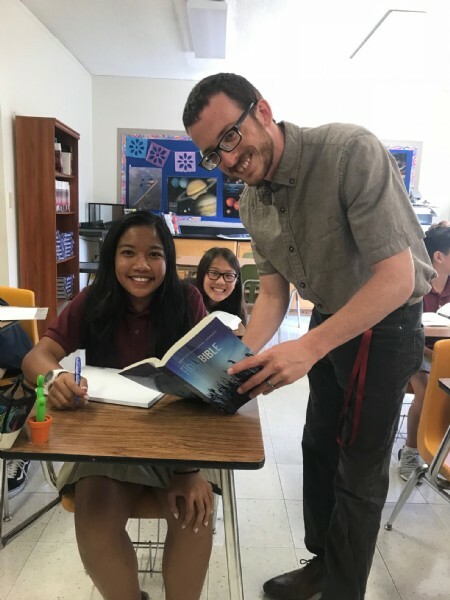 Prior to coming to Judson Mr. Hogue was an adjunct faculty member at Azusa Pacific University and an MCAT physics instructor for The Princeton Review. 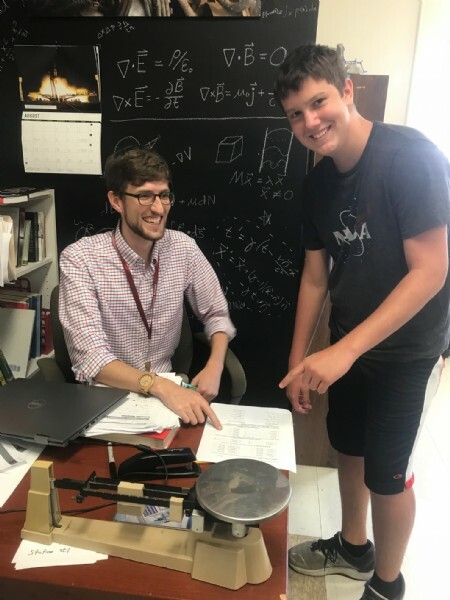 Mr. Hogue loves teaching at Judson because "The students and other staff are like a family and I already feel welcome. I look forward to getting to know everyone better!" Check out the latest news from our high school journalism team. We are proud of our graduating seniors, class of 2019. Read more here about which colleges they have been accepted and their future career plans. Singin' in the Rain takes Pasadena by storm! Enjoy this look back at our spring musical. With the weather this year, could we have picked a better show than Singin' in the Rain?